Favio Chavez knows that music is powerful. And that believing in people is too. 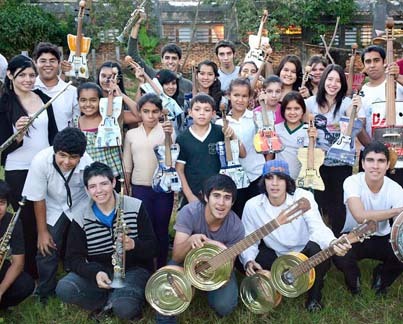 When the Paraguayan musician brought the youth orchestra he conducts to nearby Cateura, he hoped the town’s youth would discover how transformative playing music can be. But Catuera is desperately poor. It is home to the largest landfill in the country, and you can buy a house there for less than the cost of a violin. Undeterred, Favio reasoned that the same trash that buried hopes could be turned into working instruments. Collaborating with a local dump picker and self-taught tinkerer, he began sifting through the 1,500 tons of solid waste dumped there daily for parts. 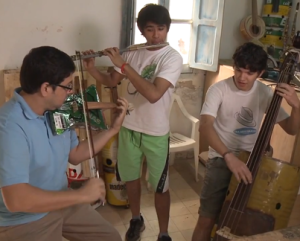 He made cellos, violins, and woodwinds from tin cans and discarded tools. Then he taught 20 local kids to play Bach and Mozart and Vivaldi. Their music will bring tears to your eyes and hope to your heart. If Favio can inspire a community to make a symphony out of trash, what can we do to co-create the future we want? Zaineb Mohammed wrote about the Landfill Harmonic Orchestra in Mother Jones. Independent filmmaker Alejandra Nash is making a documentary about the orchestra. Her Facebook page about her work includes nine more videos. You can support her at Kickstarter.